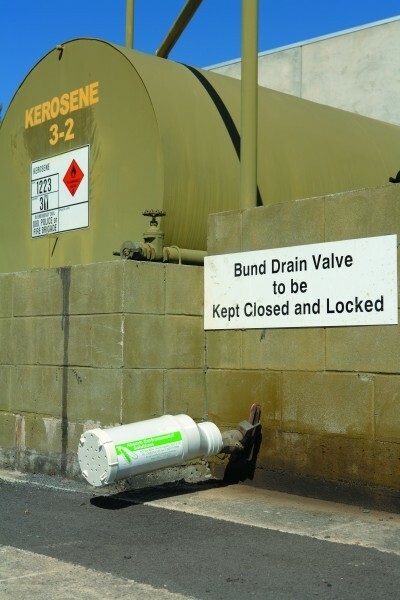 Instead of pumping out and disposing of oil and water or fuel and water mixes, fit the AES Bund Filter to the bund outlet. The bund filter captures hydrocarbons and particulates but allows clean water through. It reduces hydrocarbons to less than 5 mg per Litre, which means no rainbow film on the surface and it’s disposable to storm water by most permits. The filter can be made to fit any outlet to protect against storm water pollution. It can pay for itself after eliminating just one costly disposal. Replacement filters are easy to change. • Permanent installation on your bund drain outlet. • Replace cartridges after every 10L of absorbed hydrocarbons. When full, the filter blocks the bund outlet.